Home/Blog/How Long Before I See Results from My Hair Transplant? While the recovery process and the length of time for optimal results from hair transplantation will vary from patient to patient, most individuals will usually begin to see the initial effects within about four months following the procedure. With that in mind, there are some general things you should know so you will have an idea of what to expect after surgery. Once the donor hairs have been grafted onto the areas of thinning hair or baldness, they will eventually fall out. Please remember that this is a completely normal event – the transplanted hairs are essentially in a state of shock following the surgery, and this is a natural part of the regrowth process. Once this has occurred, the follicles enter a “resting” stage for about three months. After this period, they should begin the new growth cycle and gradually get longer and longer. While they may appear a bit uneven in these beginning stages, the transplanted hair should essentially be growing normally enough to be ready for an initial progress evaluation by the fifth or sixth month following surgery. 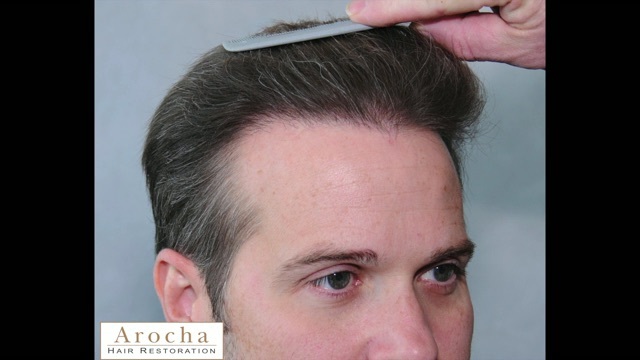 Keep in mind that the best results may not be apparent until a full 12 to 18 months after the hair restoration procedure, and Dr. Bernardino Arocha may even recommend topical solutions or prescription medication to enhance the effects and reduce the chance of any further hair loss. Ultimately, it usually takes more than a year for the full results of hair restoration surgery to be visible; however, you should be able to see the beginnings of new, natural-looking hair in the treatment areas well before then.